← BEACON goes back to Alaska! I have always been interested in bacterial resistance. My first science fair project was comparing antibacterial soap versus regular soap in terms of selecting for resistant bacteria with use. In addition, I have also always wanted to be a clinician to both better understand the human body and help those around me. At Michigan State University, I’ve found a program that allows me to continue my research while earning a medical degree at the same time. Currently, I am a 6th year DO-PhD student in the physician scientist training program in Dr. Christopher Water’s biofilm laboratory. Here, I study how Pseudomonas aeruginosa, the most common pathogen in cystic fibrosis, evolves resistance with long-term antibacterial treatment. P. aeruginosa is the leading cause of death in patients with cystic fibrosis (CF). CF is a debilitating disease that compromises host immunity, most dramatically in the lungs, resulting in life-long chronic bacterial infections. The most important clinical obstacle in CF is treatment failure due to biofilms. Biofilms are a community of sessile cells enmeshed in a self-produced thick gel matrix that leads to thousands of times more resistance to antibacterial therapies, macrophages, and neutrophils. A hallmark of CF is a defective mucociliary transport system that results in dry mucus production and clogged airways, creating an environment that is ideal for colonization by P. aeruginosa. Central to this pathogen’s success is its biofilm mode of growth within the lungs of CF patients, which are essentially impossible to eradicate with current antibacterial therapies, leading to immune complex-mediated chronic inflammation, neutrophilic tissue damage, decreased lung function, and ultimately death. Furthermore, due to their high level of tolerance, cells often re-grow after multiple rounds of therapy becoming even more resistant with time. By early adulthood, P. aeruginosa evolves and establishes a chronic infection recalcitrant to intervention in 80% of patients. Numerous retrospective studies have shown that eradication of P. aeruginosa before its chronic infectious state leads to better clinical outcomes. A key step in accomplishing this goal is enhancing current eradication therapies. 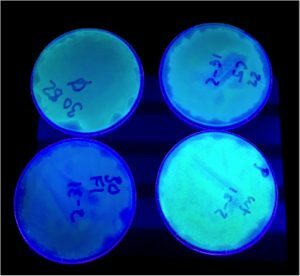 Image shows P. aeruginosa resistant mutants spread on Pseudomonas Isolation Agar plates. Plates were then imaged using a UV-light. Lower right-hand corner is ancestral strain, moving counter clock-wise, you move through time and evolution, gradual loss of fluoresces is seen indicating loss of production of a fluorescent molecule along with the development of resistances to tobramycin and triclosan. How P. aeruginosa evolves to become more resistant, is what I am most interested in studying. I’ve found that by treating with two specific antimicrobials, tobramycin and triclosan, I can drive P. aeruginosa down certain evolutionary trajectories that render them resistant to one antimicrobial (tobramycin) but sensitive to another (triclosan). In essences, out-smarting the bacteria at their own game. To do this, I serially treated P. aeruginosa biofilms over the course of 6-months with ever increasing concentrations of tobramycin and triclosan. Using this method, the biofilms gradually evolved resistance to the combination therapy and lost the ability to produce a fluorescent molecule shown in figure 1. To date, I have evolved 191 single colony isolates that are ~200x more resistant triclosan and tobramycin combined. Next, whole-genome sequencing will be performed on these evolved resistant mutants to look for genetic mutations that could explain how becoming resistant to one class of antimicrobial renders them sensitive to another. As antimicrobial resistance continues to be a major threat to global health, it is important to develop better strategies that more effectively used our current antimicrobial arsenal. This is especially true for CF, where patients become infected with evolved strains of P. aeruginosa that are essentially impossible to kill with current therapies. For this reason, P. aeruginosa is the leading cause of lethality in these patients and is a major clinical concern. This approach, funded by BEACON, could yield insights into how bacteria evolve resistance and methods for out-smarting bacteria at their own game. As a future clinician-scientist, developing new therapies that could possibly improve clinical outcomes is an exciting opportunity that I am grateful to be a part of this research. From my fist childhood experiments studying the effects of antimicrobial soap vs regular soap on bacterial selection, to studying how the human pathogen P. aeruginosa evolves resistance to antimicrobial therapies, it is clear that my curiosity for the invisible human foe has persisted. BEACON has, in-part, sustained this interest and allowed me to learn, not just about the human body, but how bacteria are so central to our evolution as a species. Evolution remains a largely un-tapped resource, and I hope this work inspires others to consider it as a tool for learning more about the world around us. This entry was posted in BEACON Researchers at Work and tagged antibiotic resistance, BEACON Researchers at Work, mutations. Bookmark the permalink.